Often we forget that true healing comes from the cellular intelligence within us, not from those that are giving us treatments, whether they are doctors, alternative medicine practitioners, or shamans. The internal physiological world of the body (organs, nervous system, cells, etc.) knows exactly what needs to be done to stay healthy. Your cells, not you, are in charge of keeping your heart beating. This is a good thing because if you had to worry about beating your heart 60-80 times per minute you would probably, unfortunately, do a bad job and end up dying. Trauma, stress, and illness (the natural fluctuations of life) unbalance the body’s state of health, but health is always at the core of the body’s intention. It is important to remember that not just you “Name, Last name” is worried about your survival, but every cell in your body is doing what it does to support its own survival and therefore also yours (no body, no you). It’s debatable whether the cells in your body even know you exist. 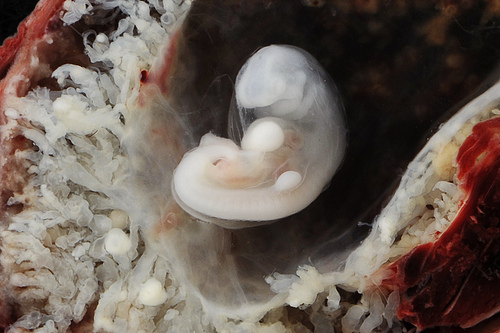 Embryo at week 3 or 4. Image from an ectopic pregnancy. What they do know is that if they do not take in nutrients and get rid of wastes they will starve and/or get sick and die. Similarly if they do not perform their specific function(s) to keep the body environment favorable for life (not too acidic, not too basic, not too hot, not too cold, etc. ), they are also certain to die. It’s important to see this and realize what an incredible phenomenon it is that almost everything in your body works independent of your conscious mind and, despite this fact, is perfectly efficient at keeping you alive minute to minute. As practitioners we aid the body in its healing process, we do not do the actual healing. We help support the physical conditions, the internal physiological environment, and the resources of the body so that it can go from maintenance mode to repair mode and properly address the obstacles it faces. Spend time paying attention to its concerns, joys, and discomforts. It’s only with your help that we practitioners can assist your body to attain its maximum state of health with the resources that it has available.